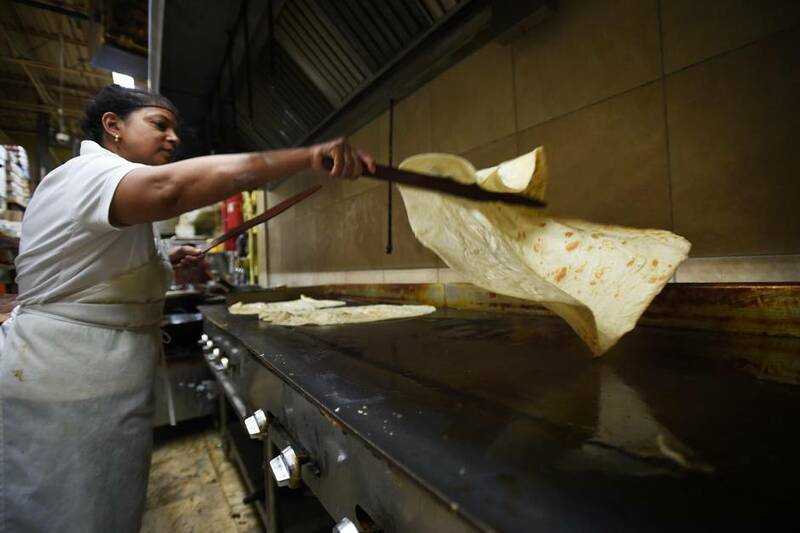 Anyone who admires the bubbled cornicione on a great wood-fired pizza, or marvels at the skill underlying French puff pastry should install themselves in the lineup outside Mona’s, the most famous Trinidadian roti and doubles shop in Scarborough. From the outside looking in, through the gaps that briefly open between the queuing patrons, you see a blur of busy hands and all-purpose flour, and behind glass, a steam table filled with curried pumpkin, spinach, chickpeas and meat. Once you cross Mona’s threshold, though, the blur begins to mesmerize. Atmosphere: A friendly eat-in/take-out shop in a well-travelled plaza, filled with homesick Trinidadians, food-loving locals and church ladies reading the Indo Caribbean World. Wine and drinks: The usual Caribbean and North American sodas. Best bets: Get the veg platter with buss up shut, the mango and goat roti in dhalpuri and definitely the doubles. If you like spice, ask for it. Prices: Stuffed roti, $7 to $13, doubles for $2, plus many other dishes. A Cheap Eats pick, where you can dine well for under $30, before alcohol, tax and tip. At the tables in the centre of the shop, and over the flat, round, stovetop roti pans called tawas, you see a dozen-odd women forming, filling, rolling, flouring, flipping, cooking, cooling, stacking and bagging the restaurant’s flatbreads – a process the restaurant calls “open-concept roti theatre.” They make paratha, which are flaky and good, but taste relatively plain, because that is paratha’s nature. But those Mona’s women make dhalpuri, also. 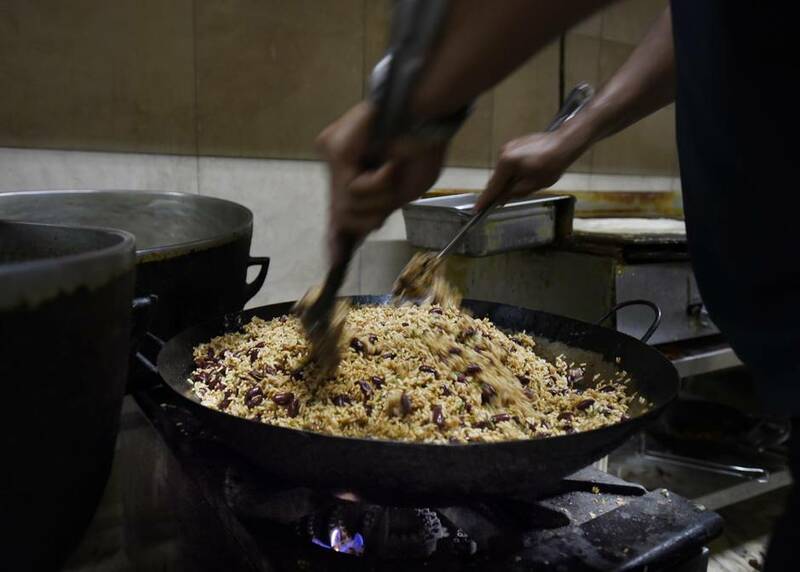 It’s the dhalpuri that come to occupy so many bread and pastry lovers’ dreams. 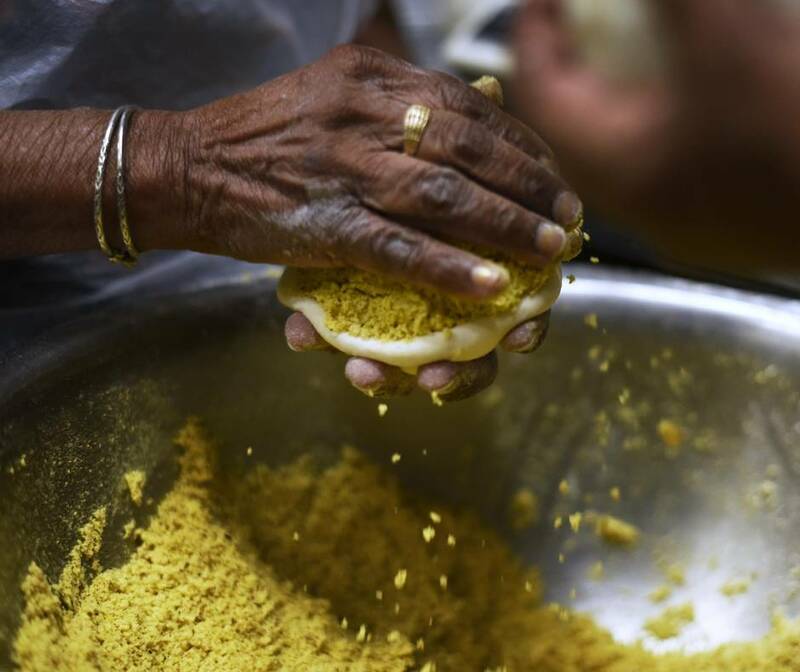 Dhalpuri are perhaps Trinidad’s most beloved food: crêpe-thin, tender, pliable bread rounds stuffed with a layer of ground, sandy-textured split yellow peas (called dhal in Hindi) that are seasoned with garlic and cumin. That room full of workers makes more than 1,000 dhalpuri daily, by hand, with painstaking expertise. But unlike puff pastry and pizza crusts or even crêpes, dhalpuri sell for almost nothing. You can buy Mona’s dhalpuri for $2 each, or have them wrapped around a good half-kilo of meat or vegetable curry for between $5 and $10, depending which you choose. As an envelope for the restaurant’s stewed pumpkin curry, they make a sweet, savoury, satisfying dinner; with bone-in chicken that’s been cooked up with peas, potatoes, Madras curry and Trinidad’s herb-based “green seasoning,” they’re one of the greatest sub-$10 meals I know. Atmosphere: A take-out only Trini restaurant, with an open kitchen at its heart. Lineups are typical, but they move quickly. Wine and drinks: Ting, Peardrax and other Caribbean sodas, cane juice, coconut water and Mauby Fizz, which is an acquired taste. 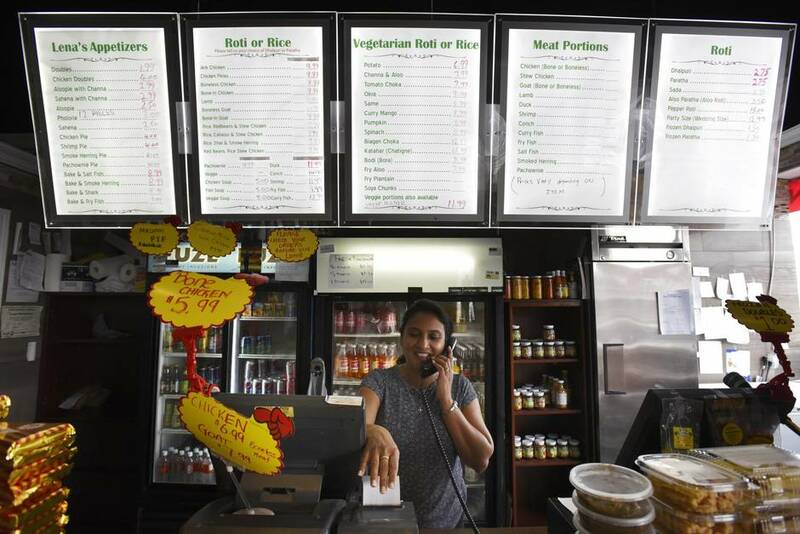 Best bets: Get the bone-in chicken roti, in dhalpuri, plus a few doubles with extra sauce. Prices: Stuffed roti, $6 to $10; doubles for $1.50; breads are $2 each, by order only, minimum of 6. Mona’s first opened not in Scarborough, but in South Trinidad. Mona Khan, a homemaker, and her husband Cyrus Khan had lived in Edmonton, Calgary, Inuvik and Whitehorse; Cyrus installed microwave telecommunications systems for Northwestel and CN Telecom. Over time, the couple had three children. And then in the early 1980s, when they’d had enough of the cold, they moved the family back to Trinidad. In 1983, in a neighbourhood of San Fernando, Mona opened her first restaurant. Their first day open, they sold out of roti, said Sasha Khan, who is the couple’s eldest child. They came back to Canada in 1987, and word soon got out among Trini expats. Before long, Sasha said, Mona, Cyrus, Sasha, his sisters Melissa and Reesa, as well as a few of their aunties, were making hundreds of paratha and dhalpuri every morning out of their little home kitchen, to fill a flood of private orders. In 2003, they finally opened the Scarborough shop. Today the entire family pitches in. They’ve been trying to help Mona and Cyrus pull back from daily service, said Sasha, but to no avail. The goat roti is also a go-to, though it’s sometimes served without enough gravy for my taste; you might want to ask for extra. As a snack, it’s always worth ordering doubles – the classic Trini street-food sandwich made from a couple of rounds of deep-fried, turmeric-scented dough, and filled with stewed chickpeas and a touch of tamarind chutney. And plenty of the customers here, who are just as likely to have grown up eating Tamil, Filipino, Jamaican, Guyanese, South Indian, Punjabi, regional Chinese, Malay or whitebread food as Trini, order just those terrific flatbreads, which they take home to slather with butter and cheese, or fill with their own creations. 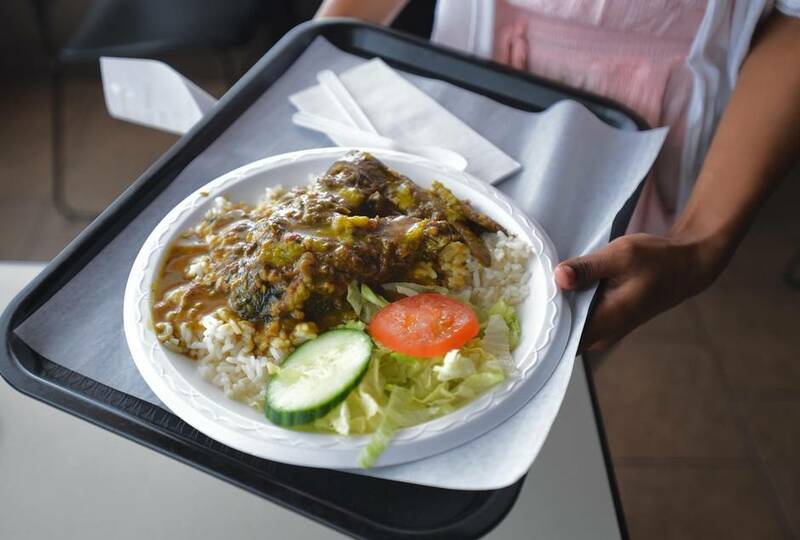 Across town in Brampton, Lena’s Roti & Doubles has operated for the past seven years from a run-down plaza just northwest of Pearson Airport, selling Trini food that’s in many ways the opposite of what’s on offer at Mona’s. 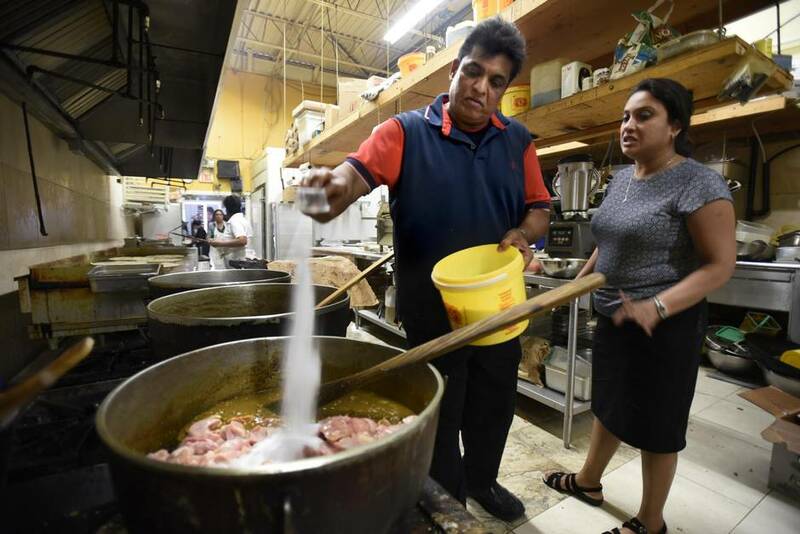 Where Mona’s menus and seasonings are built on crowd-pleasing restraint, Lena’s, which is run by Kish and Lena Ramlakhan and their daughter Amrita, doesn’t hold much back. (Daughter Nalini pitches in on weekends, but spends her weekdays in Ottawa, where she’s completing a PhD in cognitive science.) And Lena’s fillings are just as interesting as the excellent breads. The goat roti here is loose and saucy, with a big and gently gamey flavour backed by thyme and black pepper. A great way to eat it is with an accompanying mango curry roti. Kish, who does the cooking, slices green mangos, pit, skin and all, and then cooks them down with Trinidadian curry powder, onions, garlic and herbs until the pieces are sour-sweet and the onions are richly caramelized, and so it’s almost like hot mango jam, with an undercurrent of ginger and Scotch bonnet heat. The duck curry at Lena’s was very good when I tried it, though by the time it’s been piled into a dhalpuri wrapper over curried mashed potato, you might struggle to identify its meaty main ingredient. The pumpkin curry was round-flavoured and soft. You might consider ordering a couple of roti as well as Lena’s veggie platter, which comes piled with those mango and pumpkin curries, with soft, smoky grilled eggplant, stewed chickpeas and a mound of callaloo, the exquisite Caribbean mix of taro leaves (called dasheen around the islands), that are softened with coconut milk, pumpkin, okra, herbs and spice. You eat that vegetable curry platter with paratha or dhalpuri, your choice. The paratha typically comes torn a little; the proper term for torn paratha is buss up shut. The menu at Lena’s is enormous, though. You might also want that callaloo on rice, with sticky stewed chicken (this is excellent), or perhaps you’re interested in trying goat tripe, which when stewed to softness and folded into a deep-fried, samosa-like wrapper, becomes pachownie pie. I loved Lena’s pachownie pie, particularly smothered with pepper sauce, though the flavour leaves little to the imagination: It’s gutsy all right. And do not neglect to order a few of the superb doubles when at Lena’s, whether at the Brampton location or at the newer one in Mississauga, at 6990 Financial Dr.; it’s some of the best around town. The dough is soft and sweet, a little like savoury beaver tails, and provided that you ask for pepper, which you ought to, the channa, or chickpea curry, carries a beautiful thread of heat. But it’s the chutneys here that get me: Lena’s kitchen piles on Scotch bonnet sauce, tamarind chutney, green mango chutney and green seasoning, which all combine to top those doubles’ usual low, savoury, stewy and sweet notes with exhilarating hots and brights.